When I was five years old I watched my mom knitting a bright yellow afghan, and pestered her to the point where she gave me yarn and needles and showed me how the two worked together. My first project was a little blanket for my cat and it took absolutely forever. Since then I’ve made blankets, clothing, toys…just about anything you can put create I think. I love to knit while watching movies on Netflix and wish I could get away with taking my needles and yarn into movie theaters to do the same (there being no need for light for me to see to knit by – a trick I taught myself on long car rides where a person needed SOMETHING to do once the sun dropped below the horizon and you were hours from the intended destination). But knitting isn’t just useful to me, it’s relaxing. It’s a way to feel like I’m accomplishing something even when I’m buried under blankets in bed when I’m having a ‘bad’ day. Knitting has helped me to save my sanity during this long sabbatical. I feel like I can’t chatter about knitting without mentioning that I’m a total Ravelry junkie – after all where else do you expect me to get patterns for everything from a Hogwarts approved scarf to racy lingerie (no, I haven’t done lingerie yet though I’m tempted if I ever come across the right yarn.) You can look me up under Katagillian though I’ve yet to really spend time posting what I’m working on. Which is currently a dishcloth obsession with random forays into the world of sweaters. 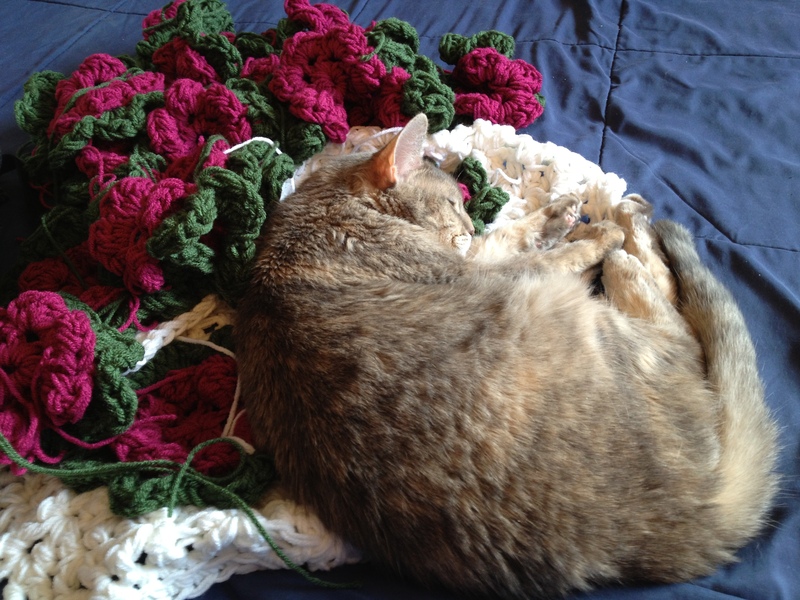 Though right now it’s near impossible to knit as I’m caught up in crocheting an afghan for my cat. Which wasn’t supposed to be for her but she somehow claimed as I was working on it. But that’s another story. I posted recently about the sweater that never got finished…well I pressed on after posting that, one row at a time sometimes. Over the weekend I finally finished knitting the pieces and even got it all sewed together. I’m pretty proud of myself. I haven’t made a sweater in forever, and this one took me WAAAAY too long to do. The thing is, I used the excuse many times over of not having time to knit. Or not feeling well enough to knit. But I wasn’t feeling good over the weekend. At all. In fact, I made the goal to knit JUST ONE ROW and then rest for awhile and not touch it again for a bit. Committing to “just one row” made all the difference. You see, if you don’t pick up the needles, I can guarantee it’s not going to get done. But even just doing a few stitches every day…got it finished. I’m not going to belabor the point or hit you over the head with my needles to get you to see it. I think the lesson is pretty clear. Let’s not give up today, ok? Whatever it is we’re facing let’s take it one step at a time. I’m putting off finishing a sweater. Er…I’ve been putting this off for the last two years. Knitting is supposed to be a relaxing hobby but there is something anxiety inducing in sweaters for me. In the time where I COULD have been finishing the sweater I have knit several scarves, even some doll clothes, and a stuff animal. But I do not finish the sweater. The front is finished, as is the back and one and a half sleeves. I think I could honestly have all the pieces done, ready to be stitched together in the space of an afternoon. Only I put it off, because sweaters…condemn. A scarf…well how can you go wrong on a scarf? So long as it’s long…ok there’s the nervousness that comes in the giving where you wonder if you got it long enough for the recipient’s preferred knotting technique…but typically it is figured that so long as it CAN be knotted you’re doing ok. But a sweater…the flaws are more noticeable. The length not right, the sleeves uneven or worse too long or too short. The collar not able to get around the head or gaping unattractively. There are just SO MANY ways to go wrong. So rather than finish, with only half a sleeve of knitting to go and I can be finished with this project and move on with my life..I find reasons not to go on. Can’t find the pattern…the yarn is knotted. I don’t have the time. I’m too tired to knit. But these excuses cover a whole lot more than hesitancy over a long-term project. It tells me that my self confidence has taken a beating somewhere down the line (again). Fear of failure…that is not even fear of failure when you stop to think about it. There is nothing wrong with rolled up cuffs or a hemline that’s a bit dodgy. It’s fear of not achieving PERFECTION isn’t it. I think that’s been the heart of a lot of my struggles since taking this sabbatical – feeling like I don’t measure up in the eyes of the world that is still managing to get up and go to work and care for their families on a daily basis, despite the things that THEY struggle with. I feel like I’ve given up when what I really ought to shed is the awful word “should” and the perfectionism that goes right along with it. I am where I am right now. I don’t need to be making apologies for that. The same goes for that sweater and all those other projects I hesitate over (the book I’m writing, the lessons I craft for homeschooling) because to my way of thinking they aren’t good enough if they’re not without flaw. Oh yes, it’s time to make a change. So it’s time to quit making excuses. Instead I look at the unfinished sweater and pick up the needles once again. It’s an afternoon’s worth of work. Maybe two with the sewing. What have you been putting off…and why?